In addition to his current post with the Dallas Mavericks, Terdema Ussery serves as an alternate governor for the Mavericks on the NBA Board of Governors. 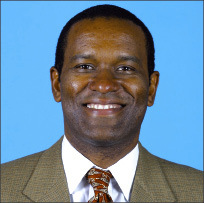 In August 1993, Ussery was named as President of Nike Sports Management, overseeing the marketing, advertising, and branding of Nike’s elite athletes, and prior to that, served as Commissioner of the Continental Basketball Association (CBA). Ussery has also practiced business and entertainment law at the firm of Morrison and Foerster. Both Sports Illustrated and Sporting News perennially rank Ussery as one of the most powerful executives in sports, and in 2003, he was named the Corporate Executive of the Year by Black Enterprise magazine. Ussery earned a bachelor’s degree from Princeton University, a master’s degree from Harvard University, and a law degree from the University of California, Berkeley. Based in Dallas, the Dallas Mavericks (www.nba.com/mavericks) are a professional basketball team of the National Basketball Association. Founded in 1980, the Dallas Mavericks have won two division titles and one conference championship. The Mavericks are the third-most valuable basketball franchise in the United States, valued at approximately $463 million and surpassed only by the New York Knicks and the Los Angeles Lakers. HDNet (www.hd.net) is the first national television network broadcasting all of its programming in 1080i HD, the highest-quality format of high-definition television (HDTV). It was launched in September 2001 by Mark Cuban, owner of the Dallas Mavericks, and Philip Garvin of Colorado Studios, and now produces and televises more hours of HDTV sports, news, and entertainment programming each week than any other network. How do you define your role as President and CEO of the Dallas Mavericks? We in sports talk about ourselves as being in the entertainment business, competing with others in the entertainment business – other sports, as well as the motion picture, theater, or amusement park industries – for discretionary income. By defining it that way, we are much more aware of macroeconomic issues and what other people are doing outside of sports. We are in the business of throwing 44 fabulous parties a year for 20,000 of our closest friends. So everything that goes along with doing that is part and parcel of my job. Part of it is the entertainment piece itself; part of it is making sure that, when people come to our home – the American Airlines Center – they feel completely welcome and entertained, the hot dogs are warm and the Coke is cold, and the people helping us to underwrite that party – our corporate sponsors – feel special. When you first came onboard, one of your focuses was the funding for the American Airlines Center. How important has that been to the growth of the brand? It has been critical, because it gave us – and continues to give us – the resources we need to be competitive in this business. We’ve upgraded our ability to entertain and provide amenities and comfort to the folks that come out to see us play. It has been a win-win, not only for us, but for the city as well, because we promised mixed-use development in and around the arena. How important is it to build strong media partnerships? Everyone is trying to figure out how people will consume sports and entertainment in the future, and it seems like, almost weekly, there are different opportunities because of digital technology. So we’ve spent a lot of time thinking about digital platforms, how people consume sports and entertainment, and how we can leverage that to do two things: build our fan base beyond the borders of the city of Dallas and leverage that into all kinds of unique business opportunities. Some of the NBA’s top players are from overseas. Will that trend continue? Yes. Because of technological advances, like streaming Web video, we are able to reach kids on other continents that didn’t previously have exposure to NBA basketball. Other than soccer, basketball is the most popular sport in the world now. The NBA broadcasts regular season games to over 243 countries. By leveraging those players currently playing in the NBA, tapping back into their native markets, and continuing to build their fan bases, we generate revenues and provide the escapism people seek in sports. You have also been very involved in the Dallas Mavericks Foundation. Is community involvement a business leader’s obligation? Within a period of a few months, I was thrust out in the front of our campaign to build a new arena. I visited different communities in north Texas and promised them, if they gave us the vote, we would reach out, be a part of their communities, and find ways to be strategically impactful in addressing community needs. The foundation grew out of that, and since that time, we’ve been true to our word. Our objective is to financially support organizations that do fantastic work, but, for whatever reason, do not receive the publicity their efforts warrant. We hope we can help build awareness about some of the great things they’ve been doing, so that others are compelled to contribute as well. So many NBA players are engaged in their communities, but the public doesn’t always hear about it. Is that frustrating? By and large, people’s impressions of professional athletes are skewed by just a few stories, and that’s where it really gets frustrating, because a lot of players are doing great work and, frankly, they want to be under the radar. They’re doing it for the right reasons, and that’s the kind of story you want told. When this opportunity with the Mavericks came up, what made you feel it was the right fit for you? I had done everything you could do in sports except run a team. It was an opportunity to bring all my skill sets to bear – to not only come in and run a team, but to also build a new building from scratch. It’s a once-in-a-lifetime opportunity. I think we’ve done everything we set out to do, except win a championship. That’s the only thing all of us in sports live for, and it’s something I’d like to have happen before I leave.